This report charts activity in the last quarter of 2016 and in some areas it shows some very promising signs, but I would have to caution on that it’s a little early to be claiming a market recovery. That being said, it is good to finally see some black ink balancing the sea of red ink we saw throughout 2016.
activity, moving up by 20.6 percent in the quarter – remember, however, that it’s coming off a very low base having hit sales volumes around 1990 levels throughout the year. But, take nothing away from these figures as it’s showing a solid growth in buyer activity. What is interesting is that the highest buyer activity is in Palmerston which is up 56 percent from the previous quarter and Alice Springs which is up 32 percent from the previous quarter. 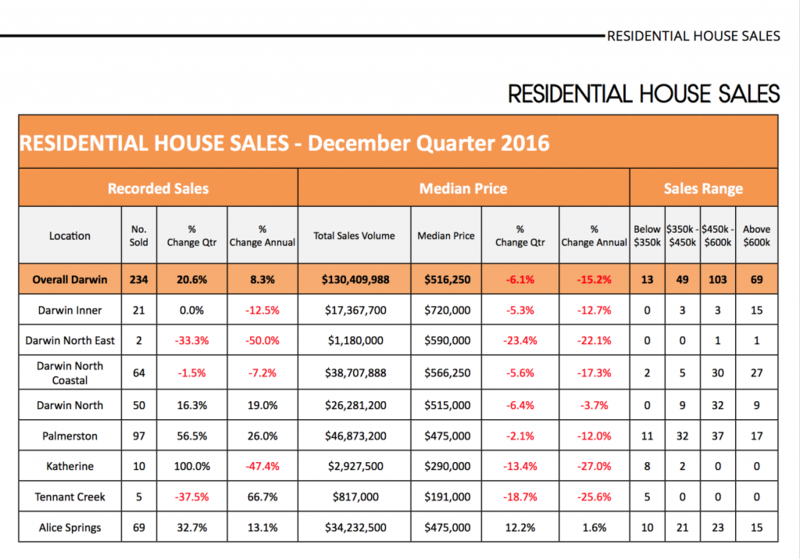 With the exception of Alice Springs, which is enjoying a very strong market bounce at the moment, median prices have continued to decline, down a further 6.1 percent this quarter for the Darwin market. Alice Springs was the only jurisdiction that saw an increase in house prices, up 12.2 percent for the quarter. 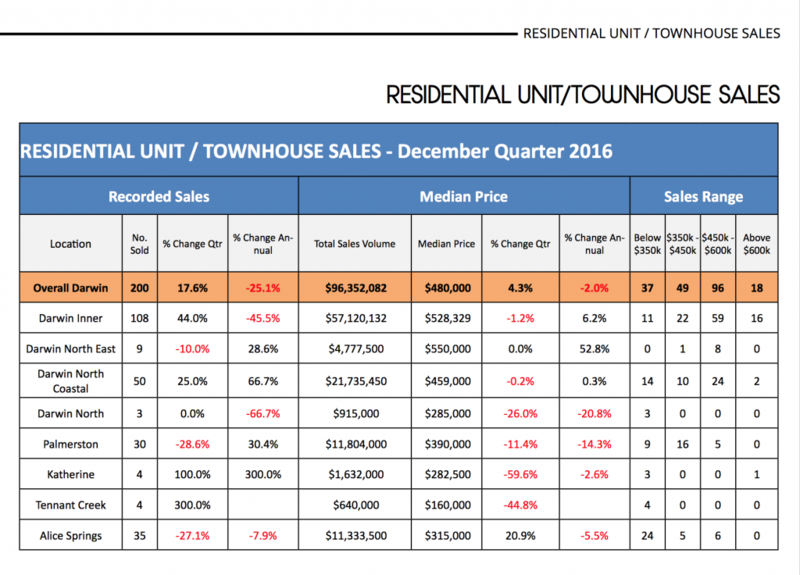 Unit / Townhouse sales also increased in this past quarter, up 17.6 percent for the quarter, but that remains 25 percent less than at this me last year. 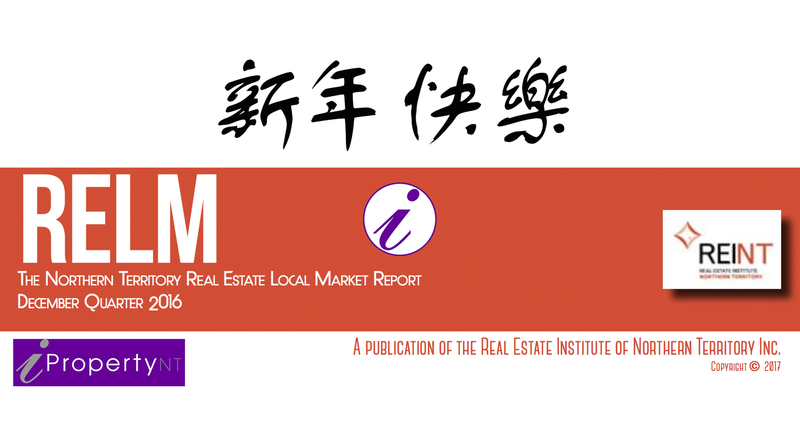 Overall the median price for units increased in the Darwin market by 4.3 percent. This sales activity was predominantly led by sales in Inner Darwin which was up by 44 percent for the quarter, but remains 45.5 percent lower than last year. Rental Yields on houses strengthened a little to come back to 5.1 percent, but fell again on units to record 4.1 percent. Vacancy rates were a mixed bag – falling in Palmerston but increasing in many other areas. Overall Darwin vacancy rates increased to 7.8 percent and Palmerston fell to 5.7 percent, which supports the anecdotal evidence we have received from our members of an increase in renter demand in Palmerston.